At Reliance, our focus is on driving the nation towards growth with our advanced products and services comprising of High-Speed Diesel, Petrol, Auto LPG, Lubricants, Aviation Fuel, Packed LPG catering to different segments ranging from two wheelers to aeroplanes & farm equipment to heavy engineering vehicles. 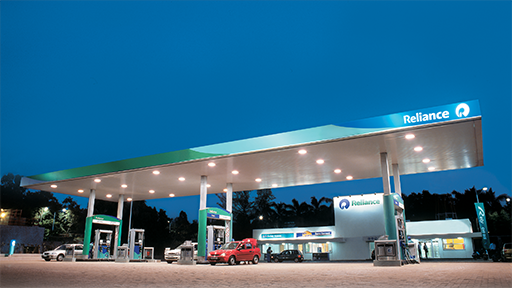 With a strategically located network of 1300+ retail outlets spread across the country, our fuel retail business provides value to our customers through a 100% automated network, backed by superior technology. The assurance of right quantity at the right price offers true peace of mind round the clock, to all our customers. Additionally, RELSTAR our lubricants business - offers a range of products to customers through its strong network of partners comprising of over 100+ distributors and 12000+ dealers. Trusted by all, its usage is widely accepted by customers across the country. The Packed LPG business serves over a million plus happy customers across homes, hotels and industry today, through its 2300+ distribution outlets. Reliance Aviation is one of the preferred suppliers of fuel to leading airlines in the country. Across 25 airports, we are providing high quality Aviation Turbine Fuel, fuelling 1 aircraft every 3.5 minutes across our operating network. Our commitment is towards innovation through our pioneering efforts, and we promise to bring more life, vitality and freshness to your journeys. MORE LIFE TO YOUR JOURNEY. MORE LIFE ENERGY TO YOU.